In partnership with The Merwin Conservancy, the museum hosts an intimate evening in The Green Room with Dr. Robin Wall Kimmerer, a plant ecologist, writer, professor, enrolled member of the Citizen Potawatomi Nation, and founding director of the Center for Native Peoples and the Environment. Her research interests include the role of traditional ecological knowledge in ecological restoration and the ecology of mosses. She is the author of Gathering Moss which incorporates both traditional indigenous knowledge and scientific perspectives and was awarded the prestigious John Burroughs Medal for Nature Writing in 2005. 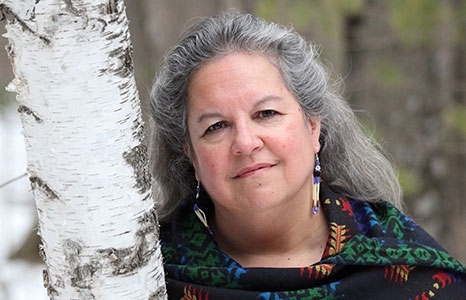 Her latest book Braiding Sweetgrass: Indigenous Wisdom, Scientific Knowledge and the Teachings of Plants was released in 2013 and was awarded the Sigurd Olson Nature Writing Award. Dr. Kimmerer's presentation will be followed by a book signing at a courtyard reception with a pop-up book store. The Green Room is an environmental and literary salon series that fosters a reverence for language, nature, and imagination. Made possible with support from Halekulani Hotel and the Atherton Family Foundation.